(Nanowerk News) In 1880, brothers and colleagues Jacques and Pierre Curie discovered that putting pressure on certain materials created electricity. Taken from the Greek word for “squeeze” (piezein), piezoelectricity was born. Commonly known as the “piezo effect”, it also occurs when an electrical field is applied and changes the dimensions of materials. More than a hundred years later, PI Ceramic (a division of PI Physik Instrumente) is a leader in the field of piezo ceramic components, including its newest line of mini transducers. One of the latest applications of miniature piezo tube transducers can be found in scanning fiber / scanning catheter endoscopes (SFE). These miniature endoscopes provide laser-based high resolution video to enable minimally invasive procedures. 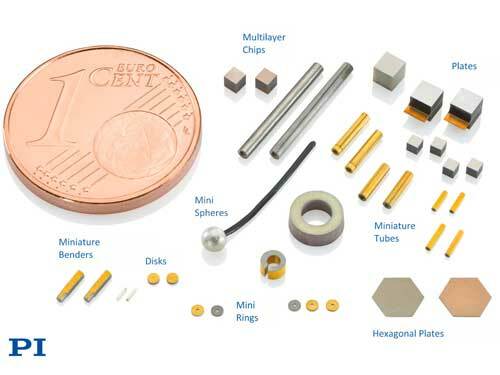 Miniaturized piezo plates are used to drive pumps for micro-dosing and nano-dosing of drugs. Ultrasonic piezo transducers can be used for bubble detection in dialysis or blood transfusion applications and for atomization of medication (aerosol generation) to name a few. Piezo ceramic actuators and transducers achieve high dynamics with frequencies up to Millions of Hertz and excellent reliability. Various shapes and very small dimensions are possible to create precision motion based on crystalline solid-state effects. For example, the new ultra-small piezo tube transducers come in two standard sizes: 0.2/0.5mm ID/OD (inner/outer diameter) with 4mm length, and 0.9/1.5mm ID/OD with 15mm length.